This is the story of the tombstone of my paternal 5th great grandfather, Robert Xenophen 'Zed' Barkley, and the mistake it still carries 174 years after his death. Robert and his son, Richard Alexander Barkley both fought in the Dawson Campaign at the Battle of Salado Creek in Texas in 1842. Robert, nicknamed 'Zed,' serving the Republic as a Texas Ranger, was killed during the battle, and Richard was taken prisoner. 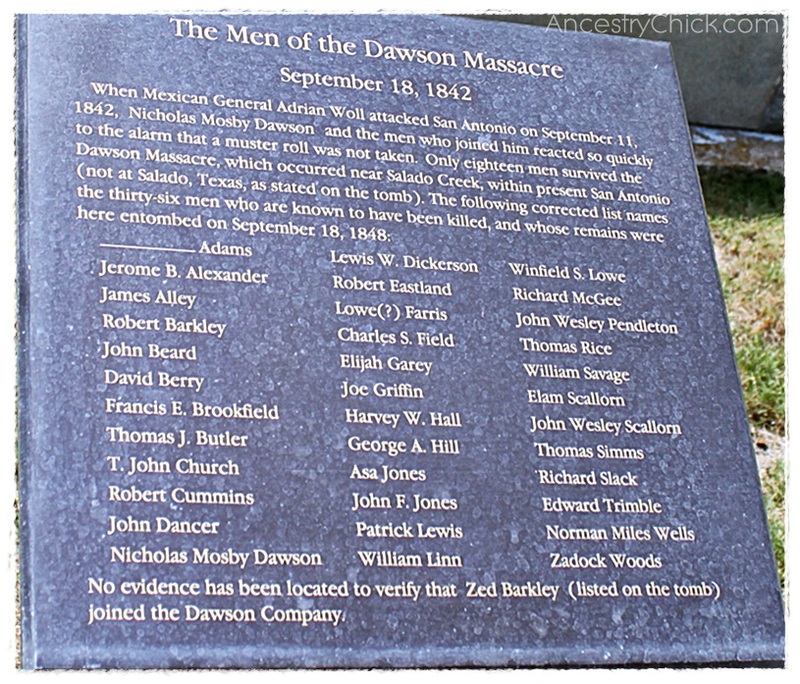 Fifty-three men were involved in the Battle of Salado Creek, and thirty-six were killed that day. Two men managed to escape, while the fifteen others were taken prisoner. Only nine of the men taken as prisoners would survive, one of whom was Robert's son, Richard, who escaped much later. 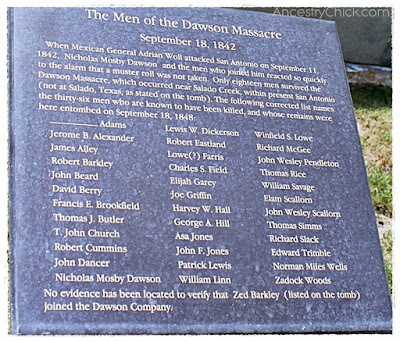 The remains of the men killed at Salado were buried on September 18, 1842. Six years later, in 1848, those remains were moved to Monument Hill Tomb south of La Grange, Texas. This crypt stands as a memorial to the brave men who died at the Dawson Massacre, and others at the later "Black Bean Incident." 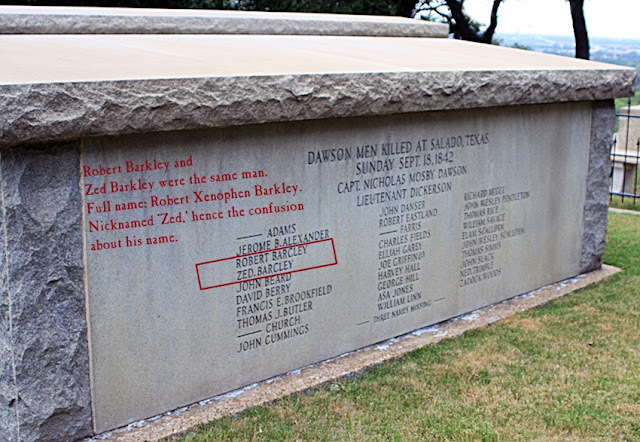 Among those remains is Robert Barkley, however his name on the memorial is reported twice on the memorial due to that error with his name. Since Robert's middle name was Xenophen, his nickname, 'Zed' was the cause of the confusion. Both names were referenced and both ended up appearing on the tomb, though they are both in fact the same person: Robert Barkley. Even the standing marker that notes the names of the men's remains includes a postscript at the bottom that references 'Zed' Barkley as not being at the battle. This is an error that has been resolved by later researchers and historians--because 'Zed' IS Robert. I'm really fascinated by this ancestor and his resting place, so I thought it was appropriate to share for this Tombstone Tuesday. I've been reading a lot about Robert and his family over the last few weeks. He was a very interesting man, whose life story would (in my opinion anyway) make an interesting movie. I only wish I had learned about Robert Barkley when I still lived in Texas, because I'd have loved to visit his grave. 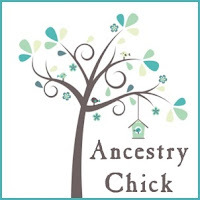 I'm Tina Grimes, the Ancestry Chick. I am an Artist, an Educator, and a Time-Traveling Ancestry Hunter. I am also a happy wife and mother and proud grandma.